Union High School was a small school and as a result, students were able to participate in a large number of extra-curricular activities. For example, Jack Flouer, Louie Weikle, Gene Baker and Bill Mohler of our class were in the Band and at same time were playing on the football team. One year we played the half-time show in our football uniforms. Other members of our 56 class that played football were Richard Jenkins, Donald Dunbar and Ward Miller. All of us started playing our freshman year in 1952. We played football for the next four years until graduation. During that time we had approximately 16 players and all of us played both offense and defense every game for four years. We couldn’t miss a game because there was no one to sub for you. Our football field was a dirt field except for the southwest corner where there were some big limestone rocks, we avoided that area when we could. There were no lights or bleachers so our games were played during the day. Our athletic teams were not of championship caliber so we could play with limited ability. We had a series of coaches… as coaching at UHS didn’t appear to be one of the “plum” jobs. One year a newly hired coach showed up for practice on a hot sunny day about two weeks before school started. He had us use him for a tackling dummy and he encouraged us to hit him as hard as we could. After the morning session we took a lunch break and then returned that afternoon for more practice. When we got there we were met by Charles Allen, our principal. Mr. Allen conducted the afternoon practice and our new coach was nowhere to be seen. We found out later that the coach had become intoxicated during lunch and was fired. We must have hit him too hard?! Later, Bill Perry took over coaching duties for that year. Another stand-out memory is that… at some point one of the coaches had managed to purchase a set of castoff practice uniforms that had been used by a professional team (or so we were told). The uniforms were incredibly large so we used lots of adhesive tape to keep them on. Maybe the thought was that we were supposed to grow into them but we never did. Our next three years we were coached by T-Bone Gwinn. We ran the “T” formation and I think we all can remember “Old 27R”. 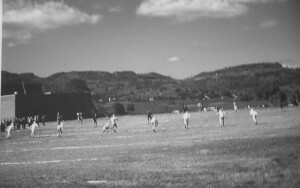 One of our most memorable games was with Bramwell High School on our home field. I am not sure what year but on Friday morning, the day of the game, it started raining and by afternoon the field was standing in water… no grass… just mud. The Bramwell team and their band arrived in three chartered buses, they were known as the “Millionaires”. We played the game in the biggest mud battle in history… we had mud in our eyes, nose, ears and everywhere you could imagine… plus the slipping and sliding. I guess you could say it was fun. At half-time the Bramwell band marched out onto the muddy field and performed and I bet it took about a million dollars to clean up their uniforms! Neither team scored in the game. Later on we played Bramwell on their home field. We dressed and ran up this big hill to get to the field, then the fog moved in and we couldn’t see the sidelines and we couldn’t see the ball when we punted or threw a pass. No one could see us out on the field so the fans left. I think the score was 7-0 in Bramwell’s favor. I guess they knew the field better than us. Another game that I remember was playing Renick High School in 1955. This was the last game the ’56 class would be playing. When we arrived at Renick High School, we found their football field was covered with snow and it was still snowing. They had the field marked with coal dust. The game was hard-fought and with a few seconds to go, Renick had the ball on our one-yard line. We scraped the snow away to find the goal line. When the ball was snapped, they fumbled… we recovered the ball and won the game. The score was 6-0. We all celebrated and went off the field into the dressing room. Someone then asked, “Where is Jenkins?” We went out looking for him and we found him still lying on the field in pain. Think of this…. our uniforms were white and it was pouring the snow and we found him lying in the end zone… he had hurt his ankle in that last play. He was lucky that we had not left Renick without him! What a “last” game to end our high school football season at Union High School.